St Christopher is not found on other English alabaster panels of the Crucifixion. In this example he is shown on the left wearing a bag-crowned hat and holding a flowering staff and carrying the figure of the Christ Child sitting on his left shoulder. Another unusual element in this composition is the sun and moon at the top of the panel, which are not found in other English alabaster panels although they do appear in some fourteenth century wallpaintings. The bearded Christ, wearing the torse and naked but for the loincloth, is on the cross in the centre of the panel. A scroll (damaged) above his head was presumably once inscribed INRI. Christ's head is inclined to his right; his right foot rests on the left, toes facing out. The nails in his hands are carved. A representation of the sun is carved on the cross' right arm and no doubt the moon was carved on the left. The Virgin, veiled and wearing a gown and mantle, stands on the left of the panel, looking towards the cross, her hands clasped in front of her. The bareheaded and beardless figure of St. John the Evangelist, wearing a gown, stands on the right of the panel, holding his hand against his face and resting his elbow on a closed book held in his left hand. With his left arm he holds a palm pressed against his body. Behind him stands Mary Magdalene, wearing a fillet on her head and holding a closed book in her right hand and the ointment pot in her left. Opposite her, on the left of the panel, is the beaded figure of St. Crhistopher, wearing a bag-crowned hat and holding a flowering staff; most remarkably, he carries the figure of the Christ Child, sitting on his left shoulder. The Child wears a long gown, his right hand is raised in blessing, and in his left hand he holds an orb surmounted with a cross. A small head visible above St. Christopher may represent an angel holding a chalice to receive Christ's blood, as such figures are usually found in this position. A similar figure of an angel was probably on the right of the panel beneath Christ's left arm.The whole of the bottom right corner of the panel is missing. There is a break across the panel at Christ's knees, and another across his left arm. The top right corner of the panel is made up with plaster. The scroll above the cross is missing. Traces of gilding remain on the background at the top of the panel. There is also gilding on the hair of the figures and on the emblem of the sun. The torse bears traces of green paint. There are also traces of green at the bottom of the panel. There are traces of red in the folds of some of the garments. The panel has been backed with slate. Formerly in the collection of Robert Hillingford. In the possession of P. Nelson from whom it was acquired by Dr W.L. Hildburgh. On loan from him since 1926. Given by Dr Hildburgh in 1946. Historical significance: St. Christopher is not found on other English alabaster panels of the Crucifixion. Mary Magdalene is not usually shown holding her emblem and standing with St. John, but rather with the Virgin and the other Mary. 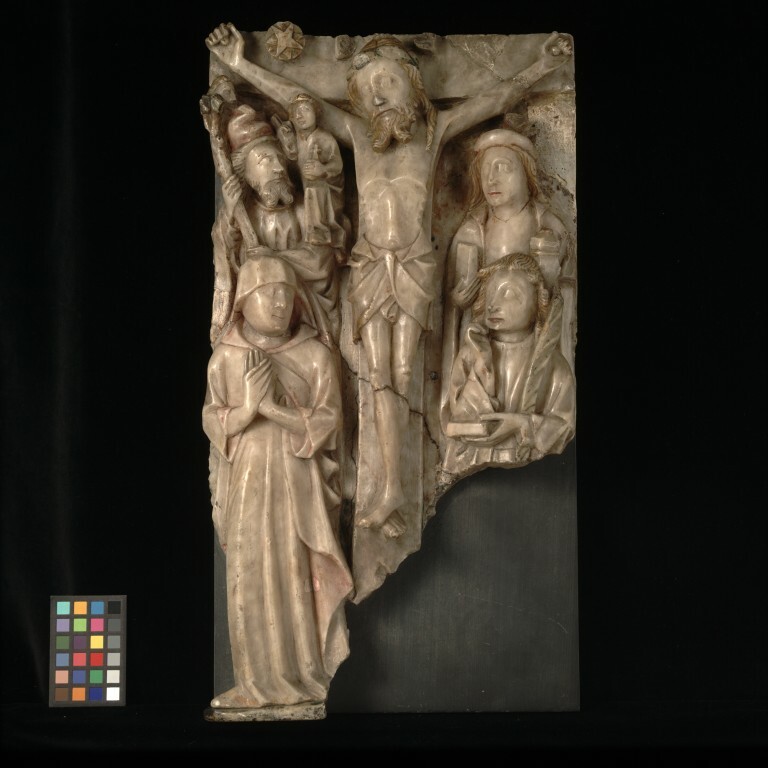 There is no other recorded English alabaster panel of the Crucifixion including representations of the sun and moon.